Internal cellular structure. 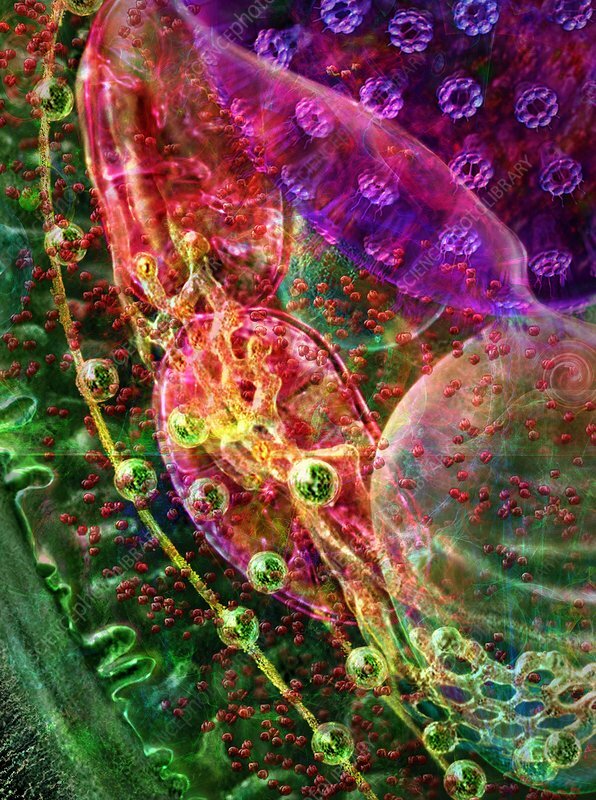 Illustration of internal cellular structures (organelles), including the cell nucleus (purple, top right), and ribosomes (red spheres) on endoplasmic reticulum (membranous surfaces). Nuclear pores are shown on the surface of the cell nucleus. The cell nucleus contains the cellular DNA (deoxyribonucleic acid). Ribosomes are the site of protein synthesis. The larger spheres (green) are vesicles that contain chemicals that are produced and transported inside a cell. Part of the cell membrane is at lower left.